..but technically it's "Hypermedia as the Engine of Application State." This is the 4th constraint Roy Fielding defined in his dissertation on Representational State Transfer (the other 3 being identification of resources, manipulation of resources through representations and self-descriptive messages. D'oh. Silly mistake, fixing now. And I definitely should've linked to Fielding's dissertation. Everything you mentioned about improving GET requests would definitely be a huge addition to Drupal's Services - it's a little strange in that I find that using the JSON Views data source solves a lot of problems with the Drupal Services node resource. I'm using the Drupal Commerce Services module, and I was definitely curious to see how it would progress in the future. I really like the idea of HATEOS, but I'm not sold that it's actually useful for mobile apps - any non-trivial app will have to still know how to display/search each resource - you wouldn't just present each field, for instance. Again, great ideas, and I'm planning to continue working on apps for Drupal Commerce, so I'd be happy to help any way I can. Hey Jeff, thanks for your comments, and thanks for sharing your project. I'll definitely have a look at it and maybe try to get 'er running locally. Re: Views and Services, yeah, a lot of my desire to really beef up our resources w/ respect to GET requests comes out of the mobile app project we were working on. It basically became a thing that was entirely driven by Views output, but I didn't like the idea of someone having to configure a View to get at something resembling a robust web service. One of the huge wins here is the native support for filtering and sorting on any property, field, or field column without you having to add an exposed filter to the View for each potential option. In my G+ thread on this topic, we discussed a bit more the pros and cons of Views (or another tool, like Search API) to power these responses. I'm obviously pretty excited about what I have now, but I'll keep an open mind and see where we can go in the future. Re: HATEOS + Drupal Commerce, I'm not sure I have a solid picture of the types of emergent behavior we should expect to happen either. However, I do expect it to happen. It might come in the form of client side libraries that know how to parse API responses and present some standard components within the target UI. One very simple example might be endless scrolling in a mobile device that knows how to read the paging links in a response and keep showing a "Tap to see more" type queue (or just autoload additional products) when appropriate. The immediate benefit, though, would be client development that doesn't have to depend on hardcoded URIs. If it knows how to traverse one Commerce REST API, you could point it at another API "root" and it could do its thing just as well. That probably doesn't matter as much for apps that have a 1:1 relationship between the client and the Commerce REST API (i.e. a store specific shopping app), but there may be other applications where it's more useful. The nice thing about emergent behavior is that we don't necessarily have to know what to be looking for. Someone will just end up doing something cool, and we can all sit back and say, "Aha! I knew we did this for a reason." Hi, Ryan. As always, great piece. I believe (and wrote in Drupal Watchdog #4) that the future of the web isn't in pages or nodes, but in *streams* of data. We're seeing that already, as information providers mash up dynamic stuff (weather, traffic) with more static stuff (maps, public filings) to create practical, to-the-minute information products. Drupal Commerce is a good example of a realization of the "data stream" concept, in the sense that product information comprises just another stream: It's ever-changing and atomic. Anyway, that's my view. So it's good to see you (unconsciously?) agreeing. Thanks, Tom. And I would even consciously agree with you. One of the advantages I saw in making full use of the fieldable entity system was that we would be able to use the same tools we have for importing / exporting content in Drupal for the store data. I apparently never finished my blog series "From Ubercrart to Drupal Commerce", but in part two I mention the big picture idea that eCommerce sites are conduits not containers, so we should do whatever we can to make it easier to get data into and out of the site. An store with an appreciable order volume will manage their accounting and fulfillment in third party systems. Orders may have come in through the front end of the website, but they just as quickly need to work their way out of the back end to these other services. A multi-channel store will likely need the same product content to be delivered to a variety of different places with differing format and localization requirements. We implemented such a site for a client recently where the Commerce backend was completely redesigned around managing these multi-channel requirements for their product catalog. So I'm right with you, and I'll see about a follow-up post focusing on how adhering to REST standards will make Drupal Commerce stronger just like architecting it around the fieldable entity system did inside of Drupal. All the data exposed by D8's Web API will be in JSON-LD (an upcoming W3C standard) so it will go beyond simple hypermedia support. You might wanna check out the specs at json-ld.org or this presentation. I was under the impression that JSON-LD was more RDF for JSON than a hypermedia type. Watching this video it sounds like a pluggable media type through the @context parameter, using metadata in the JSON to make the actual data understandable (assuming you can parse the metadata). I don't see anything along the lines of templates or links beyond entity relationships, but I could be mistaken. Mike Kelly offers hal+json, which was another strong contender for personal evaluation, as an alternative hypermedia type to JSON-LD sans RDF. 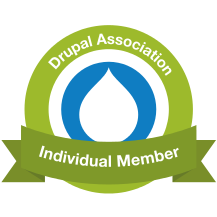 We recently decided to shift to HAL for the primary format for Drupal 8. HAL is solid on the hypermedia front. The challenge is making it generic. I don't believe we'll have a complete site traversal available via HAL, because too much of that would be site specific. All the plumbing will be there, though, including generic entity support. That means building a hypermedia API on Drupal 8 should be orders of magnitude easier on Drupal 8 than Drupal 7.